"Whatever happened to Toronto’s condo bubble? The average price of a condominium in the city popped more than 17 per cent in February compared to what the same unit would have sold for just one year earlier. The rising trendline for condo prices may well be the diametric opposite of what many market watchers were warning it could look like not so long ago, as countless cranes busily infilled Toronto’s skyline with gleaming residential tower after residential tower stuffed with tens of thousands of 700 square foot condo units. The current outcome was far from a certainty a couple of years ago, when experts openly fretted about an historic surge in construction activity ending badly. 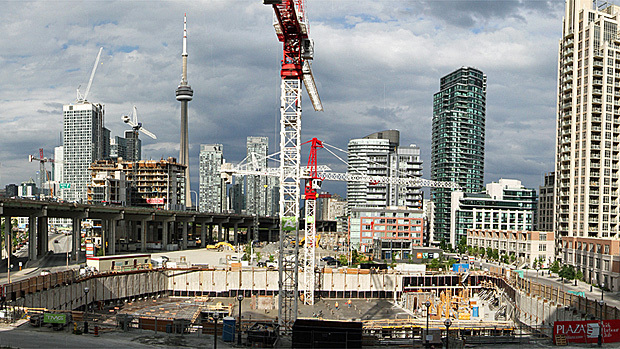 In June 2013 – as 55,000 or so condos were rising from the ground – the Bank of Canada, whose primary job is to safeguard financial stability, warned of a potential bubble forming in Toronto’s hot property market, fueled by speculative investors. The sources of stability – read: reasons why the record glut of new condos hasn’t triggered a crash— are numerous, experts suggest. To start, the thought of long commutes on ever-more congested roadways continues to push more millennials into downtown living. The long-term demographic force of foreign immigration that’s underpinned the Toronto region’s economic growth continues to do the same for housing demand. And with prices for single-family homes climbing out of reach for an increasing share of buyers, the inevitable trickle-down effect is boosting condo sales."